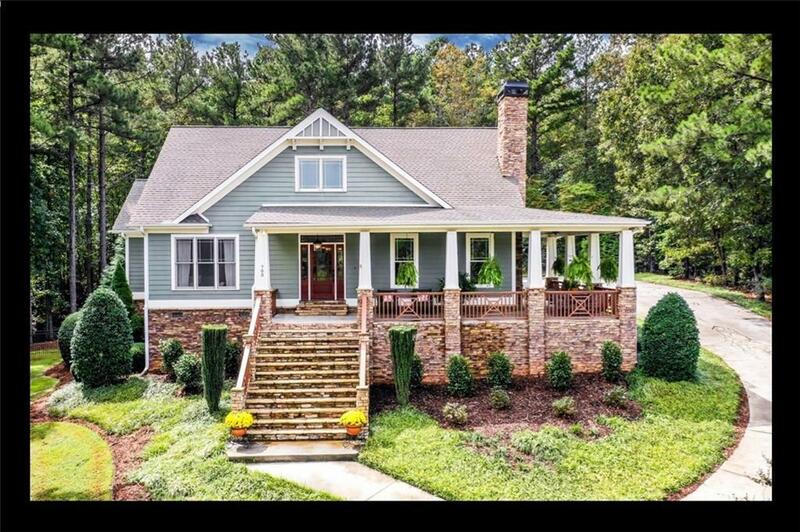 This custom craftsman style interior home in Waterside Crossing, a premiere Crescent Community on Lake Keowee, offers one-level living yet expands with an additional 3 bedrooms and two full baths upstairs, one which is a "Jack and Jill" so that all bedrooms have direct access to a bathroom. A bonus room over the 3-car garage has its own separate staircase. The wrap- around front covered porch is easily accessed with one step from the driveway as it wraps around to make easy access to this beautiful and well cared for home. You must experience this home to witness the setting as both the front covered porch and the outdoor space in the back yard is totally captivating. Let's discover how you would enjoy owning this home! The rooms are open to each other on the main level, yet the space for each is clearly defined. A fireplace is flanked by built ins in the Living Room. The kitchen features custom cabinets, granite counters, and beautiful appliances as well as a center island which opens to the dining room. The owners of this home converted the original deck that extends along the back of the home and covered it, they leveled the back yard and installed a paver patio with an outdoor kitchen and added a decorative fence. Extending this space offered the joys of outdoor entertaining by adding the fire-pit which is a great gathering space for family and friends. You can almost smell the S'mores! The Master Bedroom suite features one of the largest Master Bathrooms you will find. And the walk-in closet is large enough for two people to use. The hardwood floors gleam in this home. As noted, there are 3 bedrooms upstairs. The guest en-suite will please any of your guests. It is lovely and well appointed. The bonus room over the 3-car garage is an ideal space for an office, hobby room, kids playroom, or "anything" room. This home has many features that would be on the list of "must haves" for a serious home buyer as the garage is huge and there is one step into the home so that is very desirable. The laundry room is on the main floor so this home will be suitable for many buyers. The boat slip that conveys with this home is B-18. The owners are aware that the driveway has areas to be repoured and wish to inform buyers that these will be repaired or the buyers may wish a credit.